Whiteman hosted the show from 1933 to 1935. He was a character, billing himself as "The King of Jazz, although he didn't really play jazz per se. However, he did play with some of the jazz greats and did have some jazzy moments. 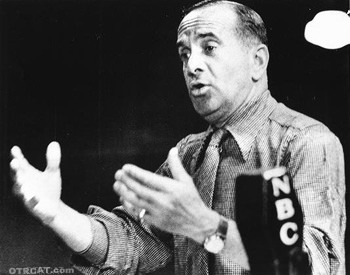 Al Jolson dotted the Kraft Music Hall landscape, first as a singer from 1933 to 1935, then later as the star and host from 1947 to 1949. Oscar Levant piped in with his dry wit during 1947-1949. Jolson kept working until shortly before his death in 1950, with these shows as some of his last. 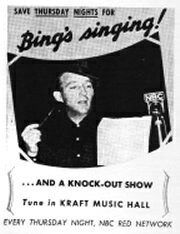 Bing Crosby was probably the best known as the Kraft Music Hall host, and the longest-running, from 1936 through 1946. His casual style and humorous easy-going banter made the show tops with the young "country club set. The average listener was 21 during this period, compared to the average age of 11 at the movie houses. Intelligent humor and delightful guests made these years some of the greatest. 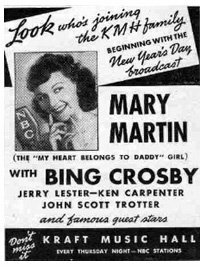 On the show, Bing rubbed elbows with the likes of Spike Jones, Lina Romay, Lucille Ball, Victor Borge, Gene Kelly, the Andrews Sisters, Nat King Cole, Zasu Pitts, and Peggy Lee . It was during these years on the Kraft Music Hall that Bob Burns popularized his famous "bazooka instrument (made out of pipes and a funnel), coining the term which was later used so often by soldiers that it came to name the weapon. Cass Daley was another popular female comedian who made her name on the show before appearing on Fitch Bandwagon. Several others hosted the Music Hall, though for shorter periods. Edward Everett Horton, Eddie Foy and Frank Morgan all hosted from 1945 through 1947. Nelson Eddy took over the summer spots in 1947, and with costar Dorothy Kirsten in 1948 and 1949. The show was supported by a fantastic cast – singer and pianist, Ramona, Helen Jepson the soprano, Jack Fulton the tenor, Roy Bargy, and funny-man music critic Deems Taylor. If you enjoy Kraft Music Hall, you might also enjoy hearing more shows by some of its hosts. Listen in to the old time radio show collections of Bing Crosby, Al Jolson, and Paul Whiteman. Be the first to comment on "Kraft Music Hall"
Kraft 411009 Host Don Ameche,D.Ellington,D.Fairbanks,Jr.